When requesting a free online valuation, it's essential for us to collect information on both the registration, and it's owner (yourself). Because we regard your privacy as extremely important, we will only use the information you supply in accordance with the Data Protection Act 1998. This page outlines what information we request, and what we use it for. Why we need it: To supply you with a valuation! What we use it for: As well as using the registration to issue you with a valuation, it's also immensely helpful to us to know that a specific registration has been issued. Whilst we're aware of the majority of plate format and letter combinations that have and have not been released in the UK, with over 100 years worth of (much undocumented) history to cover there are a number that we can only make educated guesses on. 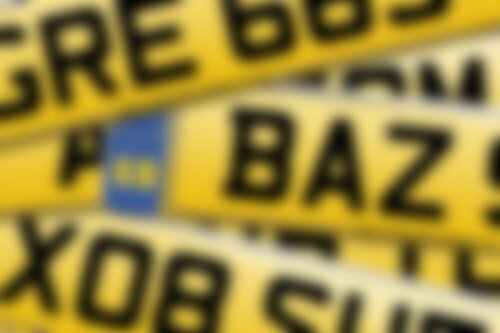 Knowing with certainty that a registration is 'out there' helps us answer enquiries not just about this specific reg, but also about reg of the same format or that contain the same number/letter patterns. Why we need it: To email your valuation directly to you. What we use it for: Your email address is used to create an account on our website so that you can return and manage your valuation(s). Your email address will be used as a method of contact to reach you when we find a buyer for your registration. You can also optionally opt in to receiving seasonal newsletters and occasional emails about number plates that may be of interest to you. What we use it for: If we know that your registration is on a certificate, we know that when it sells we will have to request the cert from you and, conversely, if it's on a vehicle we will require your V5C log book. Knowing the expiry date of the cert, or when your car runs out of tax/MOT, also allows us to identify what window we have to sell the reg in before it requires attention or your details may need amending. Why we need them: To contact you when we find a buyer. What we use them for: When we find a buyer for your registration, we always first reach out to you (the seller) to confirm that the registration is still available. This first contact is important, as if we can't reach you promptly, the buyer may move onto exploring other registrations. To this end we actively encourage you to provide as many contact means as possible - we find phone numbers and/or mobile numbers the quickest means to reach people. After the deal is confirmed, we'll also use your details to send any suitable paperwork and (most importantly!) your payment. All the details you supply are stored securely, and we never collect sensitive information about you without your explicit consent.